On the move: Australia’s Connor Fearon has emerged as one of the fastest riders on the World Cup downhill circuit. Australia’s Connor Fearon is a young downhill star who is steadily climbing towards the top of the World Cup down- hill rankings. He was ranked seventh in the world after the 2016 race season. Will he make it all the way to the top? It’s too early to tell. We’ll find that out in the next few years. It’s no easy task to beat Danny Hart, Gee Atherton, Greg Minnaar, Josh Bryceland, Aaron Gwin and all the other fast guys at the same time. That doesn’t seem to deter Connor, though. He just keeps getting faster and faster. Connor grew up in Adelaide, Australia, about 15 minutes away from longtime rival and fellow World Cup star Troy Brosnan. The two riders grew up racing each other on South Australia’s top downhill courses for over a decade. Sam Hill, Chris Kovarik and Bryn Atkinson were some of the older Australian downhill stars who influenced Connor’s development when he was growing up. While Connor is primarily a downhill racer, he is no one- trick pony. He loves dual slalom—whenever he gets to race it—and he says he wishes it were still a World Cup event. He also likes to go surfing a couple times a week when he’s home in Australia. On top of that, he also competes in the Whip-Off World Championships in Whistler, Canada, when it suits his fancy. He even picks the site of that event, Crab Apple Hits, as his favorite trail in North America. Young gun: There’s nothing like touring the world in the UCI pro ranks to make a rider grow up fast. Connor Fearon: In Adelaide, South Australia. CF: When I was 3 years old. CF: I raced motocross before I did downhill. I was a mid-pack rider, so not so great! CF: When I was 9. CF: I won the Under-13 category. CF: I won State Championships in Under 19s and Elite. CF: Second at the Leogang World Cup and fifth overall in the World Cup series. MBA: Can you tell us something interesting or unusual about yourself? CF: I have some metal plates in my face from a crash in Norway, and I have fake teeth from a crash when I was younger. I always seem to land on my head. Favorite hobbies: Motocross Jobs held (other than racer): Bike shop salesman Always takes on a trip: Skateboard What you would be if you were not a racer: The dream would be pro motocross racer; in reality, probably a tradesman! 1. Frame: Kona Operator, aluminum, 200mm travel. 4. Tubeless tire sealant: Stan’s NoTubes. 12. Grips: ODI Motion Elite grips. 14. Chainring: SRAM 34t–38t, depending on the track, and an MRP SGX chainguide. 17. Rear derailleur: SRAM X01DH, 7-speed. Soaking it up: Connor flies through the downhill course at Val di Sole in northern Italy. Connor ended up fifth overall in the final 2016 World Cup downhill standings. 19. Shifters: SRAM X01DH, 7-speed. 20. Brake levers: SRAM Code. 21. Rear cassette: SRAM X01DH, 7-speed. 27. Head angle: Stock, 63.5 degrees. 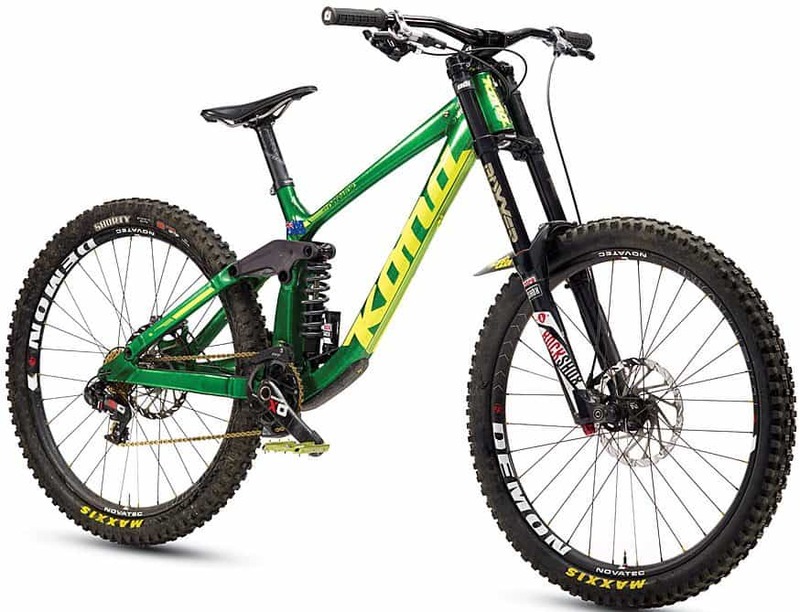 Lofting it: Connor appreciates the 200 millimeters of suspension on his Kona Operator when he’s launching off jumps on the World Cup downhill circuit.